Storms have been packing big punches in recent years. While the debate about the cause might rage on, so do the natural elements that wreak havoc on private homes and public infrastructure. As has been seen in recent years, the aging of the American power grid has resulted in extended power outages – and that increasingly seems that this will be the new norm. However, going without power for long periods of time is non-negotiable for many Americans. Waiting out a power failure is only an option for so long – and for many people, it’s not an option at all. When power goes out, preparedness goes a long way. As a new season of storms looms on the horizon, consider these tips to keep your household both safe and functional, whatever the weather. * Generate your own power. 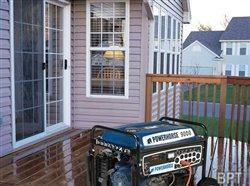 A portable generator can provide safety and comfort in both long- and shorter-term power outages. As an alternative energy source, it gives you the option to keep your household running far more smoothly than it would with no power at all. Models like the Powerhorse Portable Generator from Northern Tool + Equipment will power your refrigerator, fans, space heaters, room air conditioners, lights, TVs and more during an outage, with surprisingly quiet and easy operation. * Invert for an alternative power source. Inverters are another handy, portable option for added power. They convert power from sources like batteries into AC current, which can be used to power a wide array of necessities, from medical devices to phone chargers and beyond. The NPower Portable Digital Inverter features high surge capacity, overload and high-temperature shutdown, and even a USB port. * Be charged up. If you plan on using an inverter, be sure to keep batteries charged during stormy seasons. Having battery chargers on hand will help you be prepared to get through the aftermath of a power-disrupting storm. * Keep your home supplied. A stock of candles, batteries, flashlights, first aid supplies, prescription medicines and other helpful items like duct tape and a digital thermometer will serve you well in a short-term outage, but will also be essential if it lasts longer. * Remember food and water safety. Because tap water might become unsafe to drink, a stock of bottled water is a critical supply. If power is out for more than two hours, it’s time to start thinking about food safety. Remember that meat, poultry, fish, and eggs need to be refrigerated at or below 40 F, and that frozen food has to be kept at or below 0 F to remain safe to eat, according to the USDA. When storms strike, it can result in chaos, no matter where you live. By taking steps to prepare ahead of time, you’ll be able to cope with power outages and get life back to normal sooner than you might have expected. For more ideas and information, visit the Centers for Disease Control Emergency Preparedness page and www.northerntool.com.